Aww Europe, did you really think Sony would leave you out of the Metal Gear Solid 4: Guns of the Patriots PlayStation 3 bundle loop? Of course not! Come June 12th, European gamers will be able to get their hands on their own MGS4 bundle, complete with PlayStation 3, SixAxis controller, and of course, a copy of the game. Not the most exciting bundle really, but hey, it's a bundle allright. The pack will be priced at 439.99 Euros, perfect for any fan of the series who managed to hold out on picking up the console until now. London - 6th May 2008: One of the legends of the PlayStation® generation has taken his partnership with the platform to the next level. 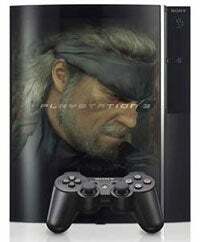 Solid Snake, the hero of the Metal Gear Solid® (MGS) franchise, is, this summer, being bundled with PLAYSTATION®3 and a SIXAXIS controller offering millions of PS3 and MGS fans around the world the ultimate gaming combo. Concluding Hideo Kojima's Metal Gear Solid saga, Metal Gear Solid 4: Guns of the Patriots is set in a battle-scarred future where huge conglomerates fight for supremacy using armies of hand-picked mercenaries. This devastated world is seen through the battle-weary eyes of an older Solid Snake who has been charged with infiltrating a number of key locations across the globe, including the Middle East and South America. As such, the epic end to Snake's story offers ground-breaking combat elements, a refined control system that offers unprecedented control over the aged hero, and the tying up of key plot lines and loose ends. Similarly, the accompanying Metal Gear Online features all the stunning stealth and combat elements of Guns of the Patriots, as it drops the player into a series of war zones and game options. With all-out 'Last Man Standing' battles to rescue and protection missions, Metal Gear Online effortlessly transfers the sublime control system of the series to an online competition, creating an absorbing battle between like-minded fans. Available from June 12 and priced at 439,99 Euros this offer is one of the most exciting bundles to date - bringing two great servants of the games industry together for the conclusion of what has been one hell of a ride!